DSCOVR’s primary task is to observe solar wind properties, being positioned at the Sun-Earth L1 Lagrangian point. This new image got me thinking about the apparent angular diameter of Earth as viewed from that distance, four times as far as the Moon from Earth, and one hundredth of the way to the Sun. The quick graphic I made below sums up the result of some calculations, see below the image for more details. For reference in the bottom right corner of the image is a scale bar showing 1.0 degrees of angular distance. A maxim you might remember from school is that the angular diameter of the Moon, 1/2 a degree, is approximately equal to that of a dime held at arms length, or about one meter from your eyes. 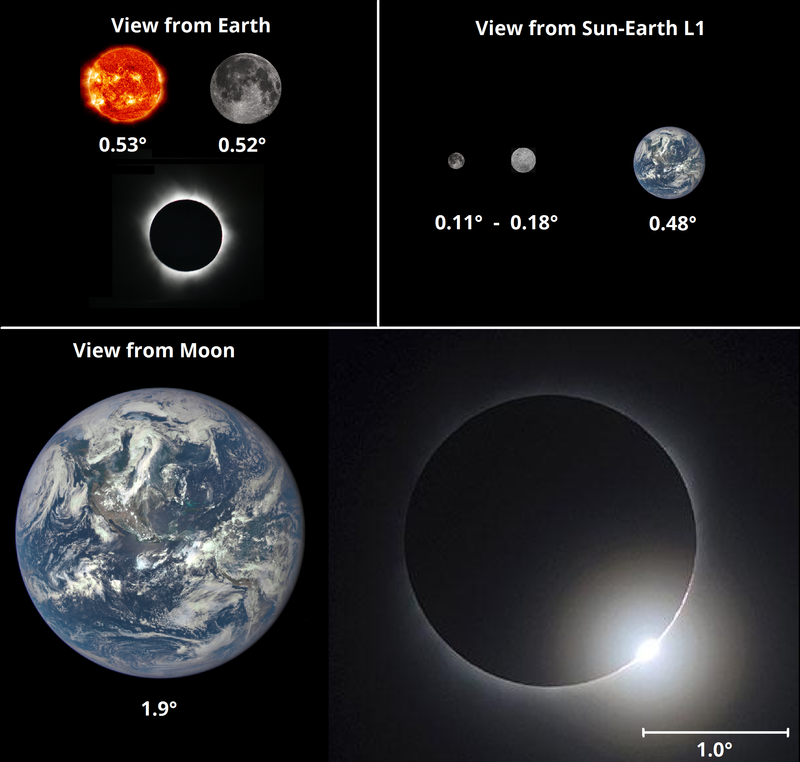 The top left shows the angular diameters of the Sun and Moon as seen from the surface of Earth, along with an image of a solar eclipse showing their near equal apparent sizes. The top right shows the angular sizes of the Earth and Moon as seen from the Sun-Earth L1 point. Two sizes of the Moon are shown to represent the change in its apparent size as it orbits Earth, retreating further from view and then closer again. The closer moon image shows the far side of the Moon since it lies between the position of observation at L1 and Earth, towards which its near side points being tidally locked to Earth. And the bottom half of the graphic shows the apparent size of Earth as seen from the Moon, as well as an image of an eclipse of the Sun by Earth taken by JAXA’s Kaguya (SELENE) spacecraft from Lunar orbit. To calculate the angular diameter of an object from a certain observation distance, take the inverse tangent of the ratio of the object’s diameter to the observation distance. The result can then be converted from radians to degrees. The numbers I used are below. This new sequence of images shows the Moon transiting Earth as seen from DSCOVR. Note that the Moon’s angular size as viewed from DSCOVR in this image is about 0.18° while Earth’s angular size is about 0.48°. Were the moon to be on the opposite side of Earth in these images, it would only appear 0.11° in diameter. In these images the moon is approximately 385000 km closer to the camera than the Earth. The DSCOVR website is up now.